The other day I was having one of those pre-Christmas tidying frenzies and was putting away lots of stuff that seemed to have been lurking on every available flat surface for a goodly while. As I went to put some of those old school self- covering buttons in their rightful home, a whole bunch of their cousins leapt out of the cupboard to greet me .... That is to say that the container housing them toppled off the overfilled shelf and the contents went all over the floor. As I was tsk-tsking at myself and the wilful nature of cupboards that can't properly contain their contents, I had the merry thought that putting those buttons to use would be heaps more fun than just stuffing them back in the cupboard. 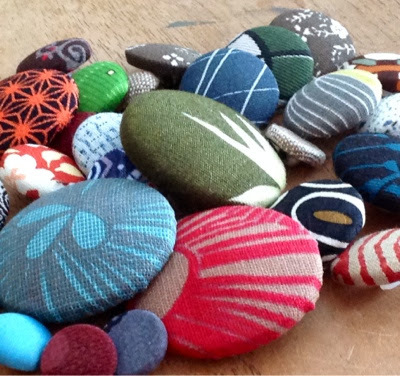 A bit more scrounging was required to find the scraps of Japanese silks and other yummy bits but I emerged triumphant! I settled comfortably at my kitchen table and happily stitched and covered for ages. All thoughts of Christmas tidiness were readily submerged beneath the snipping rhythm of sewing scissors and the satisfying 'snap' of button backs being slotted into place. Now, what to do with them? Ah yes - buttons as jewellery! 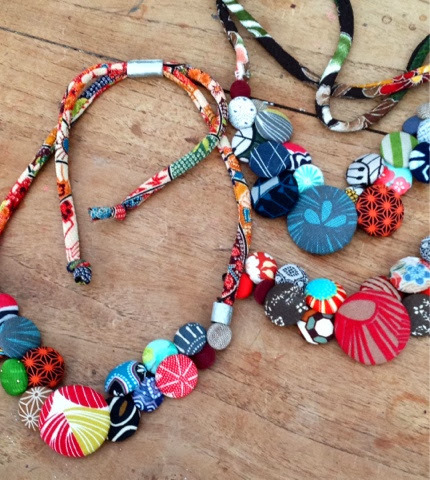 Textiles and jewellery - perfect combo! I finished them off with some lovely Chyiogami cord and made some pewter beads to hide the joins. 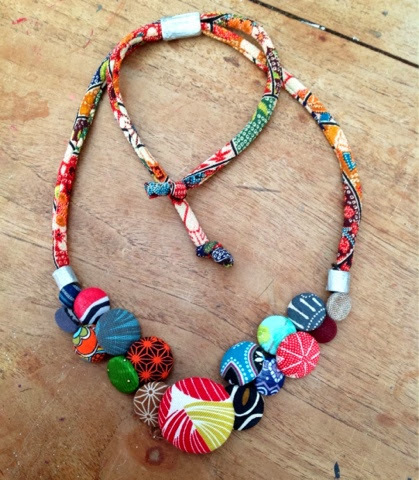 A handcrafted 'slider' bead completes the piece an means the necklace can be worn at different lengths. So you see folks there is quite a lot to be said for pre-Christmas tidying up ... particularly if you ignore it and spend your time crafting instead! Now who'd have thought that all those different patterns and colours would mix in so very well!! But they do in a very wonderful way Sue! How clever you are. I LOVE it so much. I just would never have even tried to put all that busyness together like that. I love them so much I am inspired to try and create something similar for myself - thankyou for sharing. Been a little "cray cray" around here ..